Brodi Ashton wowed us all with her knack for public speaking, making us laugh and pulling in a HUGE crowd last night at the King’s English Everneath book launch event. The 15th street gallery was completely packed to capacity with people standing in both rooms. Brodi had a power point presentation describing her path to being published. 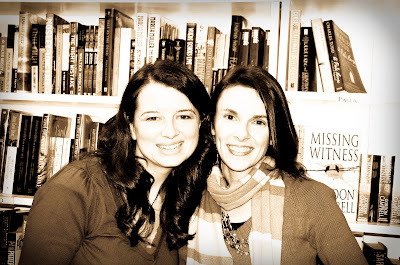 She queried over 165 agents before landing her first representation as an author. She even had a laminated scroll of all the letters to show us how persistence pays off. 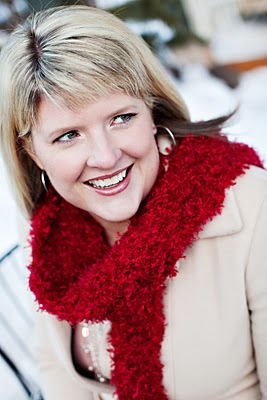 Her first book queried, Echo was set in Idaho, about a journalist who is abducted by aliens. While never accepted, her beta readers stand behind it as a hit. 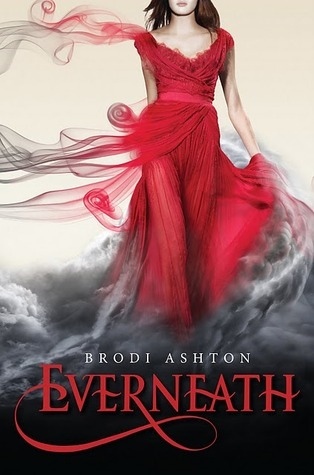 Everneath is the first in a trilogy published by Balzer and Bray, the title a combination of forever and underneath, suggested by Brodi’s critique partner and YA author Bree Despain. It features protagonist, Nikki who is quiet and broken after having made a decision which affects the next 100 years. Revisions on book two are currently in the works and must be submitted soon, it will be released in January 2013. Present at the event were local authors Sara Zarr, Elana Johnson, Nichole Giles, Natalie Whipple, Matthew Kirby, Bree Despain, Emily Wing Smith, Heather B Moore and Angela Corbett. Book bloggers included Fire and Ice, Amy O of Eve’s Fan Garden, NewUTMommy, SLC Bookworm, Erin Olds, Catie S, Maw Books, EmsReadingRoom, CranberryFries, Toomuchaubrey, BooksATrueStory and SueySays. It was fun for me because also there were many members of Brodi and my junior high and high school classes as well as her immediate family. Brodi signed copies of her book which sold out before everyone could get a copy! On hand was an Everneath sheet cake as well as lots of goodies for those waiting in the line which stretched through the entire store. She also gave away Dead Elvis guitar pick necklaces, temporary tattoos and book marks which we are giving away in a swag pack below. (Book not included) Open internationally, simply comment to enter. Thanks again to Brodi and TKE for the great event! See all of our photos on Facebook and SmugMug. Bree and I…she is just beautiful! 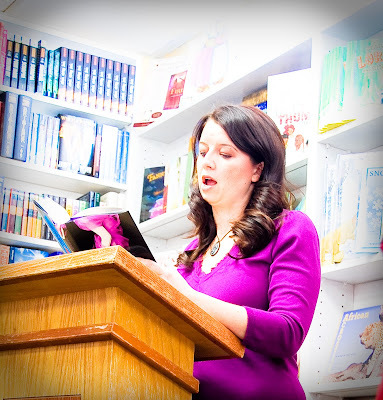 Saturday Bree Despain hosted her launch party for the Dark Divine at The King’s English bookstore in Salt Lake City. 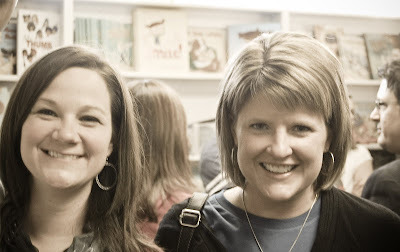 I arrived at 3:05, five minutes late, and had to wait in line two rooms away from where Bree was reading. They finally let us in and we found a seat on the floor where it was standing room only…and we still didn’t all fit! Spotted in the crowd were Sara Zarr, author of “Once Was Lost,” Brodi Ashton author of “Echo,” Emily Wing Smith author of “The Way He lived”, AmyO administrator of TwilightMOMS, Bree’s writing buddies “the Six”, Bree’s husband and two sons as well as Matthew Kirby of the 10-ers. Bree read to us all from The Dark Divine where Grace tells her family she accidentally ran into Daniel, the dark main character of the book. She explained to us how she named the book with the help of her six writing friends’ vote after originally pondering the title “Daniel Divine.” She shared writing and editing tips with fellow aspiring authors in the crowd and updated us on how the sequel is coming along. It is obvious from Bree’s reported life schedule that her family comes first and her husband is very supportive of her writing. After the reading we all filed in line for purple frosted crescent moon cookies and a chance to get our purple Dark Divine nail polish. Bree was kind to each of her guests and personable. She is very approachable and friendly. The owner of the King’s English, Anne Holman congratulated Bree saying “We have hosted a lot of very famous authors here at the store and Bree just blew them away!” They sold out of all copies of The Dark Divine to guests at the signing. Congratulations to Bree on her great launch! Pick up the Dark Divine, you won’t be able to put it down. Scroll down on the blog for our five star review as well as TDD journals and jewelry. “1. On January 5th, I will be the special quest on the “Book and a Chat” show on BlogTalkRadio.com. You can listen online, and even call in and ask me questions. 2. On January 6th, l8bloomeronline.blogspot.com is hosting a group chat in honor of TDD. Come chat with us and ask me your questions. 3. I’ll be doing a reading and signing at the West Jordan (Jordan Landing) Barnes & Noble on January 16th at 2pm. 4. I’ll be participating in an Authorpalooza at the Sandy B&N on February 6th. This is a great opportunity to meet several local authors at once, and pick up great V-day gifts for your friends and family.